I’m Texan through and through, complete with the arrogance to believe my state is the best, the ability to tell tall tales convincingly, and the propensity to say “y’all” and “fixin’ to” and, on occasion, “ain’t.” The towns I’ve lived in have a Southern influence, so sweet tea, grits, and “bless your heart” are also part of my cultural background. And since all of Texas has a heavy Mexican influence, jalapenos are part of my diet. I have a Texas accent, naturally, but I’ll tell you right now: Hollywood’s version of how we talk is ludicrous. I’m my mama’s fourth and only living child; Daddy died in 1997, so it’s just Mom and me from my side of the family. My parents each spent a stint as professional entertainers, which explains why I’m such a ham. However, I’m not fully baked–I can stand before a group of virtually any size, but get me face to face, and I may have an attack of shyness. That’s when my feet kick in. They’ll either run off with me, getting me out of harm’s way as quickly as possible, or they’ll land in my mouth. Both of them. At once. Usually makes for a memorable occasion. I’ve been blessed with five kids (one of whom waits for us in Heaven) and seven grandkids, but I’ve never been pregnant. My family is a gift from my husband–even though most were grown and gone by the time I married him. My husband and I currently live in a forest in Deep East Texas with dreams of moving closer to home in central Texas. Won’t be long now–he retires soon, God willing. As is true with other authors, I’ve been writing all of my life. I’d love to prove it to you by printing one of my earlier pieces, but I foolishly left everything from my old desk in a paper bag, which the cats found and shredded into thousands of little pieces–bag, poetry, short stories, song lyrics, everything. They went to bed without their Friskies that night. In the late ’90s, I took up writing again more seriously–studying the craft, learning from other novelists, and writing, writing, writing. The result of all that work was my award-winning debut novel, Give the Lady a Ride, which was published in 2011. 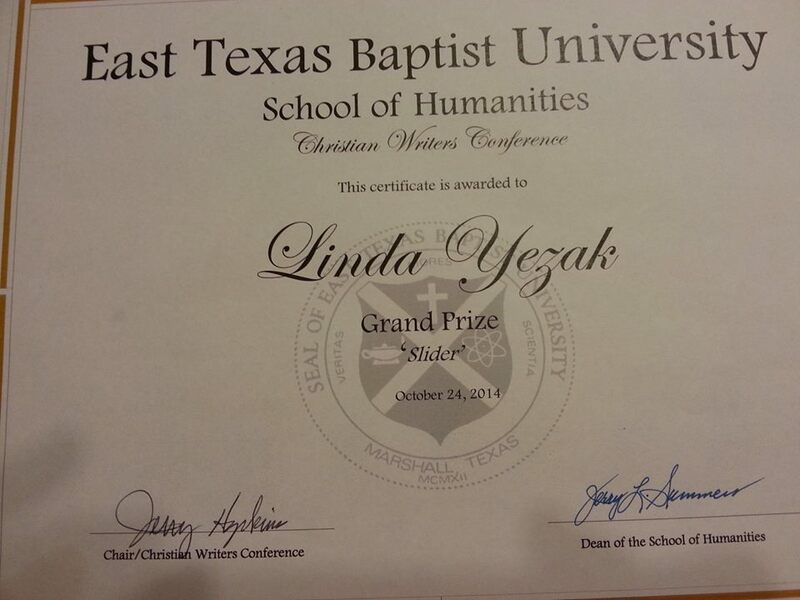 In 2014, my short story, “Slider,” won first place in short stories and grand prize in the East Texas Baptist University Writers’ Conference. Since it was the first short story I’d written since I was 16, that was quite a pleasant surprise. It also received honorable mention in Saturday Evening Post’s “Great American Fiction Contest” in 2015, and is included in their 2016 anthology. Aside from my writing, I enjoy speaking for writing groups and conferences. I’m a member of American Christian Fiction Writers (ACFW) and a proud contract editor for the many imprints of Lighthouse Publishing of the Carolinas. Just wanted to let you know I read your book, Give the Lady a Ride, and so enjoyed it! I reviewed it on my blog and also posted a review on Amazon. Thank you so much, Shanna! I have just discovered your website, and as a neighbor over here in Southwest Arkansas, I found much in your “About Me” section to which I could relate. I’m a fairly recently retired professor of History and Geography from Texarkana College. So though I live in Arkansas, I worked in Texas and lived in Atlanta, TX for 16 years, I’ve once again taken up the pen and am having a blast. Last night I put my first website online! Sorry for the punctuation, but it was exciting, after struggling with it for three days. It’s still messy, but it IS online. I look forward to purchasing and reading your book, and to keeping up with your writing — which I absolutely love! Thank you so much, Janet. Best of luck to you with your new website. Welcome back to the writing world! I guess you could say I was referred to you by K.M. Weiland or Via her site and communications on facebook for your “possible” (Maybe Free) Editorial services. However I just need a professionals opinion on my manuscript and possible suggest as to a Literary Agent? If you know any? Hi, Sarah. I’m sorry, but I don’t give away my services. My prices are listed under the tab “Triple Edge Critique Service.” A manuscript critique–which is basically what you’re asking for–is $5.00 per page. As for agents, if you’re looking for a Christian agent, Mike Hyatt had a list of them on his site some time back: http://michaelhyatt.com/literary-agents-who-represent-christian-authors.html. The list is dated, so be sure to research the agents to be sure they’re still in business. You’ll have to research them anyway to be sure they’d be interested in your genre. If you’re looking for a secular agent, I can’t recommend anyone because I don’t work in that market. Writer’s Digest features agents in their journal and perhaps in their online site too. I wish you all the best on your road to publication! Thanks for the quick reply. I am not looking for a particular type of agent, just someone I can count on, lol. I wanted to let you know I nominated you for the 7-in-1 Award — a collection of 7 shiny blogging awards all rolled into one. Though I don’t often comment, I appreciate the honesty, strength and encouragement that comes through in all your posts. I’ve just received “Writing in Obedience” and I look forward to the wisdom I know I’ll find there. (If you’re interested in checking out my post where you’re mentioned for the award, please go to http://thisnewmountain.com/2014/03/07/7-in-1-award-nomination/.) Thank you! What an honor! Thanks, Cate! And thank you for buying the book. I hope it proves useful to you. I couldn’t find a direct email, so I’m posting here. I just wanted to say thank you for your comments on my novel, The Drowning Song, in the recent WFWA Rising Star Competition. I found your comments helpful and encouraging. Thanks for taking the time to share your thoughts and insights. I’m so glad you found my comments helpful. I always worry about that. Thanks for letting me know! I am writing to ask permission to reprint one of your statements about writing. The Education Division of Oxford University Press is preparing to publish the above 208-page paperback textbook for publication in February 2015. The initial print run will be 9,000 copies with a total print run over a period of 3 years of 12,000 copies priced at £14.99 each. This book is intended for students studying the WJEC GCSE English Language course mainly in the UK. On behalf of the authors and the publisher, I would like to request permission to reproduce the material detailed below in this book. I require non-exclusive English language rights throughout the World excluding North America in print and digital formats (to cover an identical e-book version). If you are unable to grant the rights I require and I have to apply elsewhere please let me know immediately. If you don’t mind, please submit this request to me at my business email account, lwyezak@gmail.com. Thanks! My name is Mike Eidlin and I found your blog through doing some book-related research. I’m a co-founder of bookmarq, a beautifully designed iOS social network that allows readers to connect with their friends and influencers over book suggestions. Thanks so much Linda, feel free to contact me via email. I love your humor! I have family in Texas, but have only managed to get to the state once. I am basing 2 novels in Tx, so maybe I’ll bet back out there before long. All the best with your writing. You need another trip to Texas!